Green, Sam et al. Andy Warhol. Philadelphia: Institute of Contemporary Art, 1965. 12mo. ; illustrated throughout in color and black and white; illustrated boards. Very Good. First edition. Inscribed by Sam Green “For Franco, Love, Sam.” This exhibition catalogue accompanied the first museum show of Andy Warhol's work. The exhibition, organized by Sam Green, the new director of the Philadelphia ICA, opened in October of 1965 and is remembered as both a logistical disaster and as a pivotal moment signaling the triumph of Pop Art and the emergence of Andy Warhol as a full-fledged cultural icon. In the months leading up to the opening, stories about Warhol, Edie Sedgwick, Baby Jane Holzer and the rest of his milieu had appeared in the fashion and style sections of the New York Herald Tribune, Life magazine, The New York Times, and The New York Post (and, in fact, it was largely Sam Green’s direct personal connection to Warhol and the Factory scene that had impressed the museum’s trustees enough to appoint him director even though he was only 25 years old at the time.) On opening night a crowd began to gather early and had become so large and raucous that Green, in a panic that the art would be damaged, ordered museum staff to remove all of Warhol’s work from the galleries. Only after the walls were bare were the doors opened. As curator Walter Hopps recalls, it “was one of the most bizarre mob scenes I've ever witnessed... it was the first time I saw a young avant-garde artist have a show mobbed as if it were a movie premiere.” But with no art on display Warhol and his entourage were the only thing left to see. When the crowd pressed in on them they retreated to a small balcony at the top of a stairway and remained there on display as if in a kind of impromptu performance. The crowd showed no intention of leaving and from the balcony there was nowhere to go. Eventually Warhol, Sedgwick, Malanga and the rest exited the building with the help of an architecture student who knew the building and was able to saw through a false ceiling that led to a fire escape. This book bears little resemblance to a standard issue exhibition catalogue. It consists of images from Warhol’s recent painting series (Death and Disasters, Elvis, Marilyn, Jackie, Flowers, etc.) 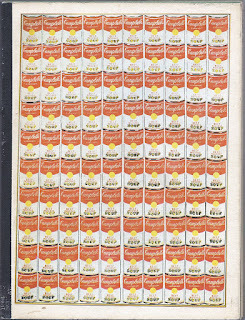 reproduced full page without captions or descriptive text and printed on heavy card stock paper colored green, white, or silver so that the resulting combinations of color and imagery are, in many cases, unique to this publication. 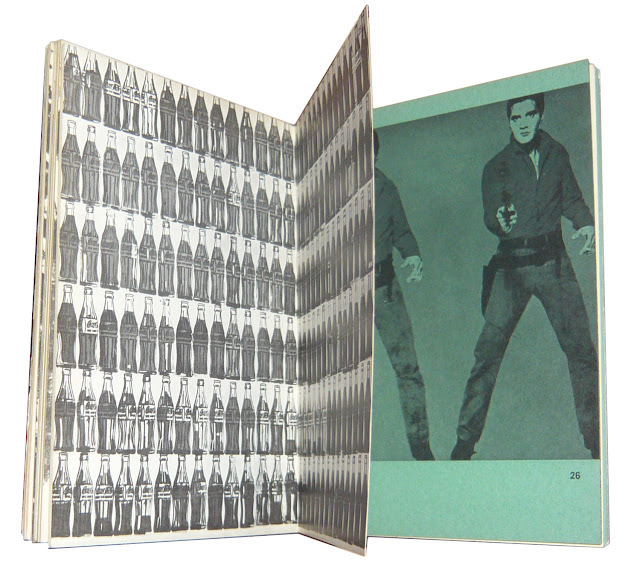 Warhol created the book in conjunction with Ben Birillo, an artist, printer and curator who was responsible for some of the most inventive ephemera of the Pop era. 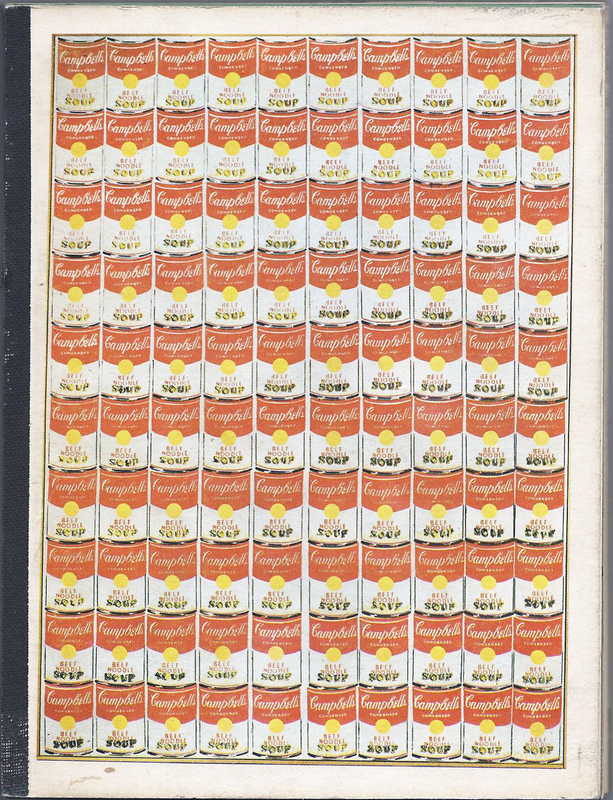 That same year Birillo had organized "American Supermarket" at the Paul Bianchini Gallery and silk-screened shopping bags--one printed with the image of a turkey dinner by Lichtenstein, the other with a soup can by Warhol--were available there for two dollars.